Sitter: Baroness Adrienne Elisabet Maria Jacquette de Geer (1879-1973), only child of Baron Anthony Gustaaf Egbert de Geer of Zeist (1851-1878) and Anna Emilia Charlotte Moewis (b. 1850); married (1909) Lt. Col. Peter Francis Fitzgerald D.S.O. of the King’s Shropshire Light Infantry (1879-1968). 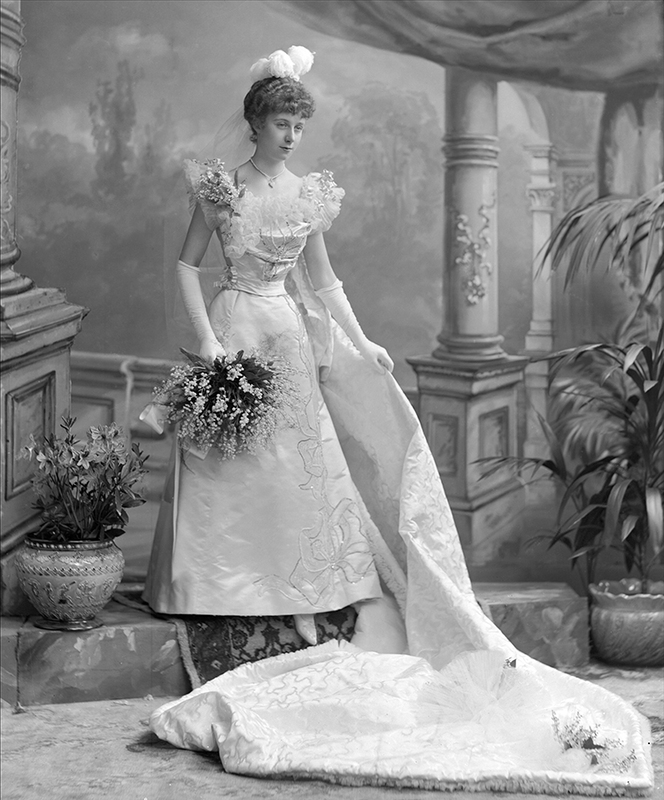 Occasion: The Court, 25 February 1898: presented by her mother, Mrs Mervyn de Montmorency. 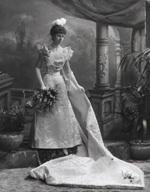 Costume: Court dress: "Presentation gown of rich white satin, the corsage and petticoat embroidered in pearls and brilliants, and trimmed with soft chiffon ruchings. 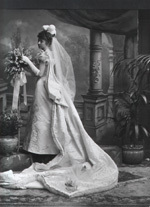 Train of brocade of graceful design arranged from one shoulder, and trimmed with white accordion-pleated tulle and lilies of the valley" (see: Lady's Pictorial, 5 March 1898, p 312c). Costume Designer & Supplier: Messrs. Russell and Allen, Old Bond Street, London, W.
Evidence of photographer at work: Right edge of backdrop visible. No of poses: 2 (see also neg no 2059). Occasion: The Times, 26 February 1898, p 14b. Costume: The Court Circular, 2 March 1898, p 198a; The Gentlewoman, 5 March 1898, p 306a; Lady's Pictorial, 5 March 1898, pp 307 (line drawing) & 312c. Costume Designer: Lady's Pictorial, 5 March 1898, p 312c. Costume Supplier: The Court Circular, 2 March 1898, p 198a; Lady's Pictorial, 5 March 1898, p 312c. Jewellery: The Court Circular, 2 March 1898, p 198a. Reproduced: Madame, 12 March 1898, p 575.